Bedrooms are where we dream. And with any luck and perhaps a few drinks, where our dreams come true. We want a mattress that is restorative and inviting, one that everyone looks forward to visiting and revisiting. Today, you can get a mattress shipped to you in a small box. It shows up and miraculously expands into a real-life sleeping surface. It’s spectacular. It’s the future. It’s a marvel and a wonder that our civilization only needed six thousand years to figure this out. To fully enhance humanity’s sleeping experience, thoughtful brands are going a step further. They’re building and shipping mattresses that are pure, that utilize natural and organic materials to avoid toxins, that bring harmony to the planet and ensure our sleep is delightful and restorative in the most profound sense. Some of these mattresses ship in a box. All of them arrive directly at our doorsteps. They empower us to awaken together happy and healthy, basking in planetary afterglow. Count sheep. Or at least count on all the pure 100% New Zealand Joma Wool in this bad boy that benefits as well from a 100% organic cotton cover, natural latex interior, and advanced, state-of-the-art innerspring coils to deliver a delicious night’s sleep. Try it for 100 nights. It ships free and returns free (like you’ll need that). And it’s warrantied for 25 years. Rip Van Winkle never had it so good. This memory foam mattress costs a fraction of the price of traditional makers. Loom & Leaf uses plant-based foam – attesting to its green credentials – and comes wrapped in organic cotton. 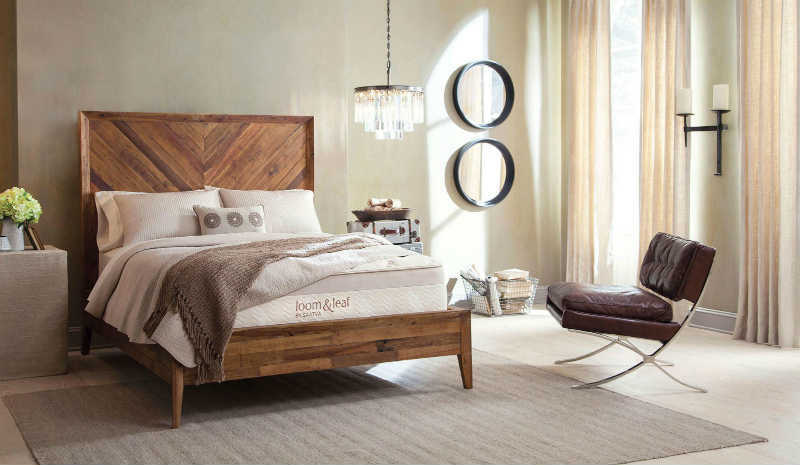 A 75-Day sleep guarantee and 15-year warranty attest to the company’s confidence in the good night’s sleep that awaits. Wrapped in a 100% organic cotton quilted cover, the Keetsa Plus Mattress combines coils and foam to deliver a world-class sleeping experience. Keetsa’s secret ingredient is Evergreen, a green tea product embedded in the mattress foam to help ensure long-lasting mattress freshness. The innovation inside this mattress resides in the unique combination of materials and technologies. It features an organic cotton cover over a natural wool topper for comfort and air flow. Beneath it is a 3-inch layer of all-natural latex. Beneath that the base consists of a 5 zone pocketed individually wrapped coil unit consisting of 1100 coils. Beneath that is the floor. The Latex Hybrid comes with a 100-day guarantee, free shipping and endless joy. The Bionda doesn’t just sound cool; this certified organic latex mattress is seriously cool. The mattress provides a healthy, allergy-friendly sleep surface combined with plush, contour-hugging softness. It features three layers of organic latex for comfort and support and an organic cotton cover that is soft, durable, removable and washable. Enjoy luxurious sleep free of worry from dust mites or allergens. This entry was posted in Furnish. Bookmark the permalink.